The Pritikin diet has been validated by numerous scientific studies (over 100) and people who adopt the diet achieve dramatic results within a few weeks. It was designed by Nathan Pritikin, a wealthy inventor who held numerous patents, who developed it to combat his own health problems. By 1960, all of the patients in his standard high-fat diet control group had died but more than a third of his low-fat, low-cholesterol group were still alive. From his studies Pritikin believed that reducing cholesterol below 160 would prevent the build up of arterial plaque. His ideas were laughed at by the medical fraternity and yet many years later they readily welcomed the work of Dean Ornish and his diet (similar to Pritikin). Perhaps because Ornish was part of the medical fraternity and Pritikin was not. In 1958 Pritikin began running 3-4 miles each day and became a vegetarian. His cholesterol dropped dramatically and his test results were shown to be normal. From his experiences he developed the Pritikin Diet which helped thousands of people to overcome heart disease and in 1975 set up the Pritikin Longevity Center® in California to promote lifestyle change. Unfortunately by the age of 68, Nathan had a recurrence of the Leukemia that had been in remission for 27 years and took his own life. The results of his autopsy were published in the New England Journal of Medicine and the results showed that his arteries were disease free and ‘soft and pliable’ like a child. Given the published studies and personal accounts available it does look his diet does work to reverse heart disease. Basically it consists of vegetables, fruit (no more than 3 pieces per day), and whole grains and some animal foods but minimal amounts of fat. The diet encourages the consumption of raw fruit and vegetables and also includes non-fat dairy (or soymilk if preferred). It limits eggs to 7 a week but without the yolks and a small amount of animal flesh (3.5 oz or 100 grams dasily), preferably fish or shellfish. The diet also allows lean chicken once a week and lean beef once a month. Nuts are allowed but only a maximum of 2 oz (57 grams) per day. The diet does not recommend unsaturated oils, refined sweeteners or artificial sweeteners (a good move) and allows only one caffeinated drink per day. It is a high-carbohydrate, low-protein, low-calorie, high-fibre, low-fat diet (fat is less than 10% of calories). The original Pritikin Diet stressed low-fat to cure heart disease whereas the more recent Pritikin Diet, based on the ideas of his son, stresses the ‘caloric density’ of food and suggests that you should eat foods that contain less calories, e.g. corn rather than corn chips. It is still low-fat but seems to be aimed mainly at weight loss rather than reversing heart disease. The Pritikin diet also incorporates 45 minutes of exercise each day. You have to remember that hunter-gatherers fat intake was adequate and consisted of mainly good fats. They usually also had a lean time of the year when there was not much fat about. It is my theory that this period probably removed any build up of plaque in the arteries if there was any. Today, we have constant access to fats (often bad ones) with no lean time to remove the effects so we should either 1) change our diet to low fat for a few months during the year or 2) eat enough of the good fats to give us what we need but not so much as to cause heart disease. Ross Horne, an early convert to Pritikin, wrote an excellent book called ‘the Health Revolution’ and it basically covers the Pritikin Diet. You can access it here for free. Ross, though a great fan of Pritikin and a personal friend, found that even though the diet reversed heart disease, over time, people on it started to complain about experiencing other problems, like arthritis and cancer. This led him to modify his views on the diet and modify the diet itself. You can read his book ‘Improving on Pritikin’ for free here. 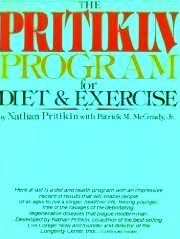 Final note: The Pritikin Diet can reverse heart disease and lower weight. Over 70,000 people have done the pritikin programme with good results at the Longevity Centre but I believe that the restriction of fats leads to other problems in the long-term. You could follow this diet but I would cut back on the grains, up your protein and add more saturated fat and it will be a lot healthier. Better diets are the paleo-diet (though difficult to stick to) or the zone diet (a better bet for most people).